The Environmental Impact of Acoustical Ceilings . The Fifth Third Center in Cincinnati, Ohio, became a repeat 3M™ Window Film customer. When the building manager decided it was time to update the film on the 32-story facility after two decades of successful energy conservation, both the technology provider and the installer were obvious choices. Local 3M window film dealer and installer Solar Tint returned to the facility 20 years after the first installation to help the Fifth Third team enhance its energy efficiency measures with 3M™ Sun Control Window Film Neutral 20. With a payback period of less than one year and more than $100,000 in energy savings in the first year, it is clear that 3M’s window films provide results facility managers can take to the bank. 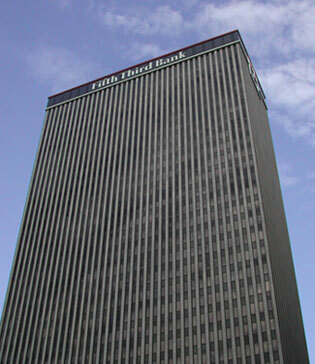 Fifth Third Center is a 32-story skyscraper in Cincinnati, Ohio, which serves as the corporate headquarters for Fifth Third Bank. Built in 1970, the building is the fifth tallest in the city’s skyline. Facility managers first incorporated 3M™ P19 Scotchtint™ window film on the Fifth Third Center in 1987 with installation services provided by Fairfield, Ohio-based Solar Tint. In 2000, the building manager decided to update the facility’s window film to further reduce energy bills and increase tenants’ comfort through heat mitigation. The numerous windows on the facade of this imposing structure enhanced the striking architecture of the skyscraper. But the glass also allowed the sunlight and heat to stream through into the office space. The challenge building operators faced was filtering the sunlight and heat in order to keep building occupants comfortable and manage energy costs with an enhanced building appearance. When it came time to reinstall the film, the supplier for this project was clear: the Fifth Third Center’s windows would again be entrusted to Solar Tint, now operated by Vice President Jason Young – the son of the Solar Tint founder, who had managed the 1980s project. Young and his team conducted the installation without disturbing the employees in the Fifth Third Center. In addition to controlling internal temperatures, the window film provided a more uniform look to the building by hiding the various types of blinds used on each floor.